This article is about gestational age in humans. For information on gestational age in non-human animals, see gestation. Gestational age (or menstrual age) is a measure of the age of a pregnancy where the origin from woman's last normal menstrual period (LMP), or the corresponding age as estimated by other methods. Such methods include adding 14 days to a known duration since fertilization (as is possible in in vitro fertilization), or by obstetric ultrasonography. The popularity of using such a definition of gestational age is that menstrual periods are essentially always noticed, while there is usually a lack of a convenient way to discern when fertilization occurred. The initiation of pregnancy for the calculation of gestational age can be different from definitions of initiation of pregnancy in context of the abortion debate or beginning of human personhood. Gestational age can also be estimated by calculating days from ovulation if it was estimated from related signs or ovulation tests, and adding 14 days by convention. 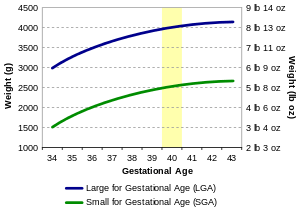 As a general rule, the official gestational age should be based on the actual beginning of the last menstrual period, unless any of the above methods gives an estimated date that differs more than the variability for the method, in which case the difference cannot probably be explained by that variability alone. 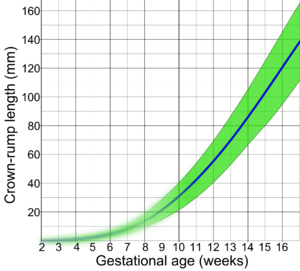 For example, if there is a gestational age based on the beginning of the last menstrual period of 9.0 weeks, and a first-trimester obstetric ultrasonography gives an estimated gestational age of 10.0 weeks (with a 2 SD variability of ±8% of the estimate thereby giving a variability of ±0.8 weeks), the difference of 1.0 weeks between the tests is larger than the 2 SD variability of the ultrasonography estimate, indicating that the gestational age estimated by ultrasonography should be used as the official gestational age. The fertilization age (also called embryonic age and later fetal age) is the time from the fertilization. It usually occurs within a day of ovulation, which, in turn, occurs on average 14.6 days after the beginning of the preceding menstruation (LMP). There is also considerable variability in this interval, with a 95% prediction interval of the ovulation of 9 to 20 days after menstruation even for an average woman who has a mean LMP-to-ovulation time of 14.6. In a reference group representing all women, the 95% prediction interval of the LMP-to-ovulation is 8.2 to 20.5 days. The actual variability between gestational age as estimated from the beginning of the last menstrual period (without the use of any additional method mentioned in previous section) is substantially larger because of uncertainty which menstrual cycle gave rise to the pregnancy. For example, the menstruation may be scarce enough to give the false appearance that an earlier menstruation gave rise to the pregnancy, potentially giving an estimated gestational age that is approximately one month too large. Also, vaginal bleeding occurs during 15-25% of first trimester pregnancies, and may be mistaken as menstruation, potentially giving an estimated gestational age that is too low. Using the LMP method, a full-term human pregnancy is considered to be 40 weeks (280 days), though pregnancy lengths between 38 and 42 weeks are considered normal. A fetus born prior to the 37th week of gestation is considered to be preterm. A preterm baby is likely to be premature and consequently faces increased risk of morbidity and mortality. 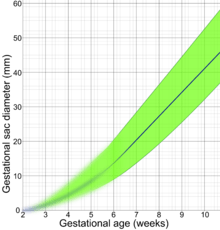 An estimated due date is given by Naegele's rule. Timeline of pregnancy by gestational age. The events of prenatal development usually occur at specific gestational ages. The gestational timing of a toxin exposure or infection can be used to predict the potential consequences to the fetus. For most of the 20th Century, official definitions of a live birth and infant death in the Soviet Union and Russia differed from common international standards, such as those established by the World Health Organization in the latter part of the century. Babies who were less than 28 weeks of gestational age, or weighed less than 1000 grams, or less than 35 cm in length – even if they showed some sign of life (breathing, heartbeat, voluntary muscle movement) – were classified as "live fetuses" rather than "live births." Only if such newborns survived seven days (168 hours) were they then classified as live births. If, however, they died within that interval, they were classified as stillbirths. If they survived that interval but died within the first 365 days they were classified as infant deaths. More recently, thresholds for "fetal death" continue to vary widely internationally, sometimes incorporating weight as well as gestational age. The gestational age for fetal viability ranges from 16 weeks in Norway, to 20 weeks in the US and Australia, 24 weeks in the UK, and 26 weeks in Italy and Spain. Gestational age (as well as fertilization age) is sometimes used postnatally (after birth) to estimate various risk factors. For example, it is a better predictor than postnatal age for risk of intraventricular hemorrhage in premature babies treated with extracorporeal membrane oxygenation. Family-based studies showed that gestational age is partially (from 25% to 40%) determined by genetic factors. 1 2 Obstetric Data Definitions Issues and Rationale for Change - Gestational Age & Term from Patient Safety and Quality Improvement at American Congress of Obstetricians and Gynecologists. Created November 2012. ↑ Tunon, K.; Eik-Nes, S. H.; Grøttum, P.; Von Düring, V.; Kahn, J. A. (2000). "Gestational age in pregnancies conceived after in vitro fertilization: A comparison between age assessed from oocyte retrieval, crown-rump length and biparietal diameter". Ultrasound in Obstetrics and Gynecology. 15 (1): 41–46. doi:10.1046/j.1469-0705.2000.00004.x. PMID 10776011. ↑ Robinson, H. P.; Fleming, J. E. E. (1975). "A Critical Evaluation of Sonar "crown-Rump Length" Measurements". BJOG: an International Journal of Obstetrics and Gynaecology. 82 (9): 702. doi:10.1111/j.1471-0528.1975.tb00710.x. 1 2 3 4 A Simple Solution to Dating Discrepancies: The Rule of Eights Hunter, L. A. (2009). "Issues in Pregnancy Dating: Revisiting the Evidence". Journal of Midwifery & Women's Health. 54 (3): 184–190. doi:10.1016/j.jmwh.2008.11.003. 1 2 Geirsson RT (May 1991). "Ultrasound instead of last menstrual period as the basis of gestational age assignment". Ultrasound Obstet Gynecol. 1 (3): 212–9. doi:10.1046/j.1469-0705.1991.01030212.x. PMID 12797075. ↑ Derived from a standard deviation in this interval of 2.6, as given in: Fehring RJ, Schneider M, Raviele K (2006). "Variability in the phases of the menstrual cycle". J Obstet Gynecol Neonatal Nurs. 35 (3): 376–84. doi:10.1111/j.1552-6909.2006.00051.x. PMID 16700687. ↑ Snell, BJ (Nov–Dec 2009). "Assessment and management of bleeding in the first trimester of pregnancy.". Journal of midwifery & women's health. 54 (6): 483–91. doi:10.1016/j.jmwh.2009.08.007. PMID 19879521. ↑ Barbara A. Anderson and Brian D. Silver, "Infant Mortality in the Soviet Union: Regional Differences and Measurement Issues," Population and Development Review 12 (December 1986): 705-738; Barbara A. Anderson and Brian D. Silver, ""The Geodemography of Infant Mortality in the Soviet Union, 1950-1990," in G. J. Demko, Z. Zaionchkovskaya, S. Pontius, and G. Ioffe, Eds., Population Under Duress: The Geodemography of Post-Soviet Russia (Boulder: Westview, 1999): 73-103. ↑ Mohangoo, AD; Blondel, B; Gissler, M; Velebil, P; Macfarlane, A; Zeitlin, J; Euro-Peristat Scientific, Committee (2013). "International comparisons of fetal and neonatal mortality rates in high-income countries: should exclusion thresholds be based on birth weight or gestational age?". PLoS ONE. 8 (5): e64869. doi:10.1371/journal.pone.0064869. PMC 3658983 . PMID 23700489. 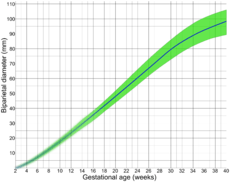 ↑ Li, Z; Zeki, R; Hilder, L; Sullivan, EA (2012). "Australia's Mothers and Babies 2010". Perinatal statistics series no. 27. Cat. no. PER 57. Australian Institute of Health and Welfare National Perinatal Statistics Unit, Australian Government. Retrieved 4 July 2013. ↑ Royal College of Obstetricians; Gynaecologists UK (April 2001). "Further Issues Relating to Late Abortion, Fetal Viability and Registration of Births and Deaths". Royal College of Obstetricians and Gynaecologists UK. Retrieved 4 July 2013. ↑ Alan H. Jobe, MD, PhD. Post-fertilizational age and IVH in ECMO patients. RadiologySource Volume 145, Issue 2, Page A2 (August 2004). PII: S0022-3476(04)00583-9. doi:10.1016/j.jpeds.2004.07.010. ↑ Clausson, B.; Lichtenstein, P.; Cnattingius, S. (2000-03-01). "Genetic influence on birthweight and gestational length determined by studies in offspring of twins". BJOG: an international journal of obstetrics and gynaecology. 107 (3): 375–381. doi:10.1111/j.1471-0528.2000.tb13234.x. ISSN 1470-0328. PMID 10740335.